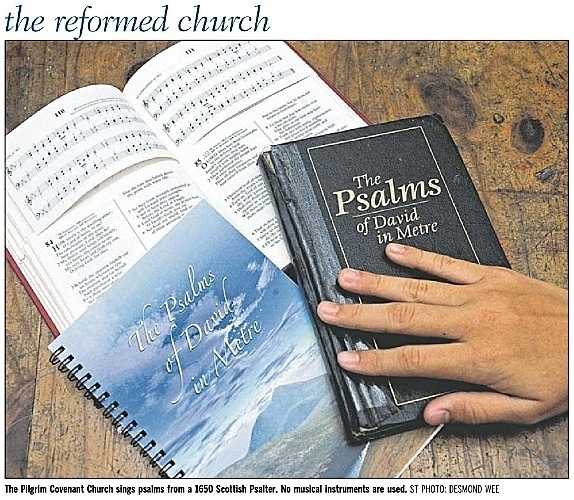 “The church sings psalms from a 1650 Scottish hymn book in a room without adornment. There are no instruments. Pastor J. J. Lim, 46, exhorts the congregation of 150 at Pilgrim Covenant Church, perched on stackable plastic chairs, to obey God rather than bend to modern society’s norms and noise. In 1999, the former software engineer founded the church, which desires to live right by being rooted in Biblical truths. ‘We are taught how to worship in the fear of God rather than merely for carnal enjoyment,’ he says. Such an emphasis on upright living flows from searching the Bible and the Reformed statements of beliefs, mainly the Westminster Confession of Faith. This is regarded as an accurate summary of the Bible covering all aspects of church, society and family life. ‘It teaches us who God is, and what duty God requires of man. It points us to the Holy and Sovereign God, and to Jesus Christ our Saviour,’ Pastor Lim explains. Reformed churches are a spectrum of Protestant denominations established in 16th-century Europe. They were part of the Reformation, a radical time when reformers like Martin Luther and John Calvin opposed the doctrines and corruption of the Roman Catholic Church. Core Reformed beliefs include the sovereignty of God, and that salvation depends on God’s grace and not man’s merit or effort. At Pilgrim Covenant Church, roots and anchors are important. Says its deacon, Dr. Fong Chee Wai, a biomedical scientist in his early 40s: ‘We live in a world that is changing constantly – our physical, social, economic and cultural environment evolves so fast due to Singapore’s openness to the world. Members of the more back-to-roots Reformed coterie know what to say when fellow Christians think their churches are strict or boring. 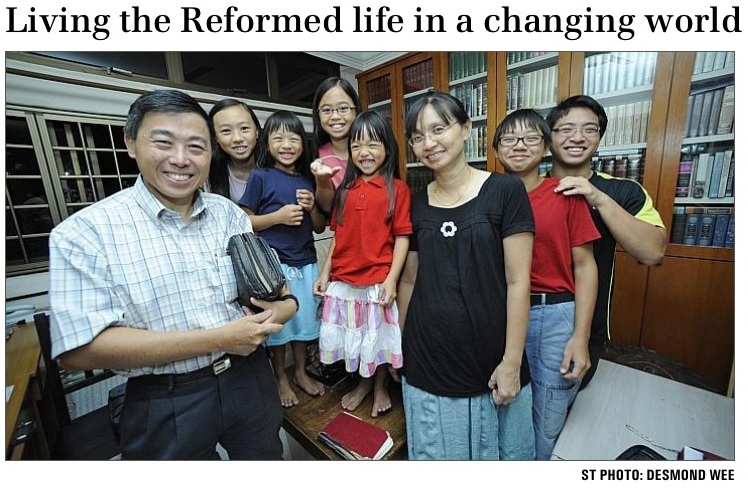 Student Sarah Lim, 15, who attends Covenant Evangelical Reformed Church, says the Reformed life is ‘invigorating and passionate’ – whether she is studying the life of unrelenting reformers or bonding with friendly church mates of all ages over sports, picnics, and Bible study. Certainly, Mr. Jeff Low, 26, from Pilgrim Covenant, leads a life steeped in beauty. The administrator of a contemporary Western art gallery is trained in classical guitar. His repertoire runs from classical to Spanish flemenco, and he has danced the tango for years. While music is his passion, he can appreciate singing without instruments from the 1650 Psalter or hymn book. Unlike modern versions, it contains only biblical psalms arranged for singing. Dr. Fong Choon Sam, dean of academic studies at the Baptist Theological Seminary, discerns both roots and constant reform within the movement. ‘In their time, reformation ideals were radical and almost anti-institution,’ he says. Meanwhile, Pastor Lim prays that more Singaporeans, always busy, with no time to reflect, and seeking instant gratification even in church, will ‘return to the old paths’. ORIGINS: The first Reformed churches were established in Switzerland, and they spread in Europe during the 16th century. They were one branch of the Protestant Reformation, ignited when reformers like Martin Luther and John Calvin opposed the doctrines, practices and corruption of the Roman Catholic Church of the day. New Protestant churches were birthed in this religious upheaval. TRADITIONS: Reformed theology is expressed in statements of belief such as the Westminster Confession of Faith, deemed an accurate summary of doctrines and covering all aspects of church, society and family. The more austere churches limit their music to Biblical Psalms and exclude instruments. BELIEFS: The movement emphasises God’s sovereignty, and that it is God’s grace that powerfully saves and regenerates sinners – salvation is not based on man’s merit. This entry was posted in J. J. Lim and tagged Exclusive Psalmody, J. J. Lim, Pilgrim Covenant Church of Singapore, Singapore. Bookmark the permalink. Praise God for His work in Singapore through these faithful Reformed churches! I am greeting to you on behalf of Bethel Presbytetian Reformed Church of Myanmar. In the present I am Pastor of BPRCM, I founded on 2014 march 28. I interest Pilgrim Covernent Church to work with together mission for our country.Pilgrim Covernent Church is I do found in myanmar so that I want you to work us with partnership. Hoping to see you,please looking forward and reply.